We can go on about all the different things that go into the art of sketch-comedian-turned-omnipresent-media-creator Jordan Peele, but I will say that for me it's really very simple. 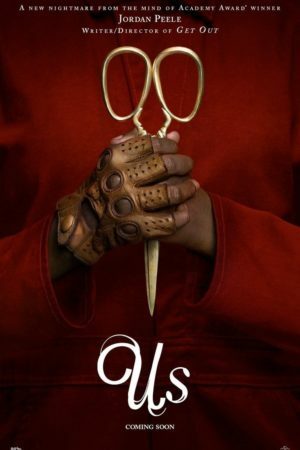 The reason Peele matters - the reason that the things he writes are enjoyable and good - is because more than just about any other new American filmmaker of the 2010s, Peele obviously loves the hell out of movies. He is a fanboy of the medium and its genres. That was the heart and soul of so many of the best sketches from Key & Peele, the series he co-created with Keegan-Michael Key, and it is the reason that his directorial debut, the (over-)lauded 2017 horror satire Get Out, was so deliciously and deliriously watchable, something that most equally-blunt message movies have never been able to claim. Take away that film's easy-to-parse moral, and you're still left with a drum-tight paranoia thriller that knows its antecedents and more importantly, knows how to evolve beyond them. So it is with Peele's second feature as director, Us, which evolves even further still. It's not nearly as laser-focused in putting forth an argument as Get Out was (which is not to say that it doesn't have an argument), and if this means fewer Oscar nominations and year-end Top 10 lists (and I suspect this will prove to be exactly what it means), that somewhat pales compared to how much better Us is at the nuts-and-bolts of making a really big, nutty horror picture, how much more you can palpably feel Peele-the-cinephile going all-in on making the kind of film that he really wants to watch. You don't get to something this loopy and big without a huge mountain of joyful passion, and that passion is totally infectious. It's been a good long while since there was a horror movie that included this much stuff on the way to being this much fun. The structure is pure slasher movie: prologue set 30-ish years ago detailing the protagonist's traumatic childhood, a first act that establishes a bland middle-class normality, a second act where the demonic stalkers show up, and a third act full of blood. The difference is all in the fourth act, where things go all the way weird; I will not spoil a solitary frame of the last 30 minutes of Us, but to say that it turns out the film that pretended to be a psychological thriller for most of its running time turns out to be something closer to cosmic body horror. And this is an astonishing twist, all the more so since given that, when it finally appears, Peele has done such a good job of nudging us in the right direction that it's less of a "wait, what?" than an "ah, I see" moment. Anyway, the protagonist with a dark past is Adelaide Wilson (Lupita Nyong'o as an adult, Madison Curry as a child), who experienced something most unnerving in 1986, on a family trip to the beachside amusement park in Santa Cruz, California: there, in a tacky hall of mirrors, she spotted a girl who looked precisely like her, but steadily refused to act like a reflection. These man years later, Adelaide is married, to Gabe (Winston Duke), with a teenage daughter, Zora (Shahadi Wright Joseph), and a geeky younger son, Jason (Evan Alex), and a handsome vacation home in Santa Cruz, California. We get the impression that annual vacations back to the site of her one great trauma have never not-bothered Adelaide, but for some reason it's worse this year. And "some reason" turns out to be a premonition about the four figures in red jump suits who appear in the driveway on the Wilsons' first night of vacation. But these are no ordinary home invaders: they're doppelgängers for the Wilsons, only animalistic: mute, violent, deformed. Only Red, the alternate Adelaide, is able to communicate through any means other than brute force, and she does so in a groaning, clicking, croaking voice, like somebody taught a cricket how to speak English after it had been eaten by a bullfrog. Take it at face value - it is perfectly satisfying to do so - and Us is basically just a stock "the killer got knocked down, haha no they didn't, now here's a jump scare" thriller, marked out primarily only by the strength of its execution. As he demonstrated in Get Out, Peele has watched all the right movies, and he assembles his influences in some really wonderful moments; Us boasts, for example, one of the better variations on the Halloween-derived "the killer seems to materialise in a dark doorway" scares I have seen in a while. But where the film really shines isn't in its overt scares, no matter how beautifully cinematographer Mike Gioulakis frames them with velvety darkness, or how superbly Michael Abels's battering ram of a score wrenches us through moodiness and into terror and then wary escape. It's in the profound uncanniness of the scenario and the performances, which are uniformly excellent; if Nyong'o is obviously the best (and, I would say with barely any hesitation, the best she's ever been in a movie), that's really only because she's got the most to do by a long shot. The thing that's amazing about all four lead roles, as well as Elisabeth Moss and Tim Heidecker's performances as the Wilsons' bland white friends, is how easy it is to forget we're watching one performer take on two characters. Whatever Peele did to his actors to get them to the point that Us requires, I'm impressed by him and sorry for them: there is a palpable sense of soul-death in Duke's Abraham, of starving carnivorous rage in Joseph's Umbrae, and unfathomable inhuman curiosity in Alex's Pluto (I can't quite bring myself to believe it's any sort of accident that the creepy little boy, maybe the most actively upsetting thing in the movie, shares a name with Michael Berryman's horrifying cannibal manchild from Wes Craven's The Hills Have Eyes). And as for Red, the alt-Adelaide played by Nyong'o, she's simply mesmerising, with something eerily wrong and ill-formed in everything from the way she puts her hands on her face to the way she uses her eyes to the scraping, rocks-on-concrete quality to her voice. It is deeply unnerving to spend time with these characters, and while the home invasion situation is, admittedly, boilerplate in its setpieces, and resolved without much actual effort from anybody but Gabe, it's plain enough that this is more of a mood piece than a crisp, clear bit of storytelling. And such mood: heavy and dark (even the sunny beach scenes are slightly dim and washed out), but veined with a more acerbic and focused version of the actually-kind-of-sour comic relief that Peele employed in his last film that keeps it from simply being morose. All that being said, the home invasion thriller material is in a sense just a red herring for what the film is actually doing, which is to create a dreamy underworld that's, on the one hand, an obvious allegory. Obvious for what I can't quite say; most of the running time, it feels like Us is about the abandonment of impoverished African-Americans by the black bourgeoisie, in small details as well as broad strokes (the film's already-celebrated use of "I Got 5 on It" is, among other things, an opportunity for the priggish Gabe to ignore the song's class implications), but as it goes along the horror is steady de-racialised. Whatever it is, it's clearly pointing out that there are a whole lot of us in the U.S. that get left behind by the rest of us, treated as sub-citizens who don't even possess their own wants and needs. If the target is more diffuse than in Get Out, it's because Us has a grander scale in mind, with a more free-floating sense of who wields power over whom. So that's on the one hand. On the other, frankly much better hand, Us is a wonderful collapse into a nightmarish underground, where lonely institutional spaces and the light implication of gruesome violence, baroque imagery involving rabbits, some phenomenal compositions of Nyong'o giving vent to Red's rage, and a beautifully edited, savage parody of ballet all combine to create a kind of collage of half-formed horror movie spaces roughly assembled into something of a dream journal of genre fare. It is so extremely easy to see why someone might consider the sprawling, messy final quarter of Us to be a huge liability; but I'm certain I'm not the only person who instead thinks it's the film's crowning achievement, with the overall breakdown of identities mirrored in the sense of the film splitting itself apart, revising its plot, its allegiances, its setting, and its tone. It's like falling off a cliff in a dream, terrifying but also weightless, and that otherwordly quality that begins to infect the movie as we start to learn just what's going on is pretty intoxicating stuff to this lover of unstable horror films.